Community-based self-management programmes have been proposed generally by national bodies in the USA and Europe as a potential, cost-effective approach for reducing the impact of OA.8 ,9 While a number of authors have reviewed the effectiveness of self-management programmes for people with OA,7 ,10 or evaluated hand OA programmes in secondary care,11 ,12 as yet there is limited evidence for effective management of hand OA in community-dwelling populations. Here we report the findings from the first large-scale randomised trial to investigate the clinical effectiveness of two self-management programmes for community-dwelling adults aged 50 years and over with hand OA. This multicentre two-by-two factorial randomised controlled trial addresses the following questions: Is joint protection education delivered by an occupational therapist (OT) more effective in reducing hand pain and disability than no joint protection education in people with hand OA? Is instruction in hand exercises delivered by an OT more effective in reducing hand pain and disability than no instruction in hand exercises in people with hand OA? This was a randomised controlled factorial trial. The main comparisons were between joint protection and no joint protection, and between hand exercises and no hand exercises. Participants aged 50 years and over, registered with five general practices in Central Cheshire and North Staffordshire, UK, were mailed a health survey between June 2008 and April 2009. Responders to the health survey were invited for an assessment at a research clinic to check eligibility for the trial if they: (1) gave consent to further contact; (2) reported hand pain in the last 12 months; (3) reported hand pain, aching or stiffness on ‘some days’, ‘most days’ or ‘all days’ in the last month; (4) had an Australian Canadian Hand OA Outcomes Index (AUSCAN) pain score ≥5 or an AUSCAN function score ≥914 ,15; (5) reported that they had not seen an OT or physiotherapist for their hand problem in the last 6 months; (6) had not had a hand operation, injection nor injured their hands badly enough to see a doctor in the previous 6 months and (7) had no other member of their household participating in the trial. These individuals were mailed a study information sheet about the trial, and a letter inviting them to telephone the research centre should they wish to attend the research clinic. Those attending the research clinic were assessed for trial eligibility by a research nurse and were included in the trial if they: gave informed consent to participate in the trial; met the American College of Rheumatology (ACR) criteria for features of hand OA,16 ,17 or had unilateral or bilateral thumb base OA; did not have an alternative clinical diagnosis, such as inflammatory arthritis, and were able to attend for the trial interventions at participating OT departments. Details of consenting eligible participants were forwarded to the research centre and participants were randomised via a remote randomisation service to one of four groups (see below). Randomisation was conducted (with an allocation ratio of 1:1:1:1) by administrative staff at the Keele Musculoskeletal Clinical Trials Unit, Arthritis Research UK Primary Care Centre, who had no clinical involvement in the trial. Randomisation was stratified by participants’ general practice, and was completed using random permuted blocks of size 4 (the blocks were randomly selected using a computer-generated random number sequence in an ACCESS database). Randomised allocation of the next patient was concealed from administrative and OT staff until the point of randomisation. Researchers who entered and analysed the data were unaware of treatment allocation. Participants were randomised to one of four ‘cells’: (1) joint protection; (2) hand exercises; (3) joint protection and hand exercises combined; (4) no joint protection or hand exercises. Participants in this last cell received written advice only and did not receive occupational therapy sessions. Interventions delivered in all four cells are described in Box 1. All participants were given standardised written information on self-management approaches for hand osteoarthritis (OA) including general information on looking after hand joints, and using analgesia (reproduced with permission from the Arthritis Research UK leaflets ‘Looking after your joints when you have arthritis’ and ‘Osteoarthritis’, respectively (http://www.arthritisresearchuk.org/), and the National Institute of Health and Care Excellence (NICE) good practice guidelines.18 Participants were advised to continue with any self-management approaches they were currently using, and were given advice to consult their general practitioner if symptoms continued to be troublesome. For 25% of participants this was the sole intervention. For the remaining 75% of participants, in addition to receiving the leaflet, they received one of three interventions: joint protection, hand exercises, or a combination of the two. The interventions were all delivered over four group sessions (held once a week) by nine occupational therapists (OTs) in two hospital centres. OTs were rotated every 3 months to minimise the potential for bias. The rotation order was determined by the OTs availability to deliver the specific intervention. Groups included up to six participants, and lasted for a maximum of one hour (1.5 h for the combined intervention). Treatment session duration and participant attendances were recorded by the OTs on case report forms (CRFs). Attendance adherence was audited by the study coordinator (SH), and was defined (a priori) to be per protocol if participants attended: session 1, 2, 3 and 4; sessions 1, 2 and 4; sessions 1, 3 and 4; or sessions 1 and 4. Any participant unable to attend week 1 was booked on to the following course. Participants were provided with workbooks (relevant to joint protection, hand exercises, or a combination of the two) including key points from each meeting, photographs of people with hand OA demonstrating the intervention and weekly activity diaries to complete. The aims of the hand exercise programme were to give the participants a clearer understanding of their hand problem, and to develop a hand exercise routine to help them improve grip strength and dexterity. Participants were guided to start with three repetitions of each exercise, gradually building up to 10 repetitions of each exercise daily (or most days), and to perform the exercises within their limit of discomfort. Exercises could be spread over several exercise sessions during the day and performed more than once a day. Participants were also asked to write down how many times they aimed to practise the exercises. The individual interventions as described above were combined in the same number of sessions but with an additional half an hour added to each session. Twelve OTs attended a two-day training programme before delivering the joint protection education and instruction in hand exercises (see online supplementary text S1). A pilot study tested the intervention protocol prior to the commencement of the main trial. Study outcomes were collected at baseline, 3, 6 and 12 months post-randomisation by postal questionnaire, and in a clinical assessment at 6 months. The primary end point for the trial was at 6-month follow-up. The study was designed so that the research nurse conducting the 6-month clinical assessment was blind to treatment allocation. However, if un-blinding did occur this was recorded. The primary outcome measure combines the pain and function subscales of the AUSCAN14 ,15 and global assessment of change23 to determine if participants were ‘responders’ to treatment using the OARSI-OMERACT criteria24 (for further details see footnote to table 1). In this factorial trial, the sample size calculation was based on the comparison of participants receiving hand exercises (intervention group) and not receiving hand exercises (comparator group), (the calculation would be identical for the comparison of joint protection vs no joint protection, as hand exercises and joint protection were assumed to be independent treatments).28 In participants in the comparator group, 50% would receive only a leaflet and advice, and 50% would receive joint protection education. Based on findings from similar populations of older adults with knee osteoarthritis, we estimated that 25% of participants receiving leaflet and advice only would improve using the OARSI-OMERACT responder criteria, and 45% of those receiving joint protection education would improve.24 ,29 This gave a combined improvement of 35% in participants in the comparator group, that is, those not receiving hand exercises, assuming equal allocation of participants between treatment groups. Published information was not available to define a minimum clinical important difference for the primary outcome measure. Therefore, after a consensus discussion with the OTs delivering the trial interventions, we estimated a worthwhile difference between groups to be 20%. Hence, the estimate of improvement in the intervention group which received hand exercises was 55% (ie, between group differences 35%+20%). To detect a difference of 20% or larger between participants receiving and those not receiving hand exercises, with 80% power and α of 5%, a total of 212 participants with data at baseline and at 6 months was required. To allow for a 15% drop-out over the 6-month post-randomisation period, we planned to recruit 252 participants to the trial, that is, 126 per group for each comparison. The main effectiveness analysis was completed on an intention to treat (ITT) basis with imputation of missing data (see online supplementary text S2 and S3 for full details of analysis methods). Continuous outcome measures were analysed using analysis of covariance (ANCOVA), and binary outcomes by logistic regression with treatment differences expressed as mean differences or ORs, as appropriate, with associated 95% CIs. Descriptive statistics were used to describe baseline characteristics of participants by randomised treatment arm and by loss to follow-up. Adherence to hand exercises and use of joint protection techniques were analysed by treatment arm at 3, 6 and 12 months. Sensitivity analyses of the trial results were conducted using (1) complete-case data and (2) per protocol data at 6 months using the primary outcome. Analyses were completed in STATA 12.0.30 No interim analyses were undertaken during the trial or follow-up period. The trial was funded by the Arthritis Research UK ISRCTN 33870549. The funder played no role in the study. Trial eligibility, recruitment and follow-up are described in figure 1. Overall follow-up rates (including minimum data collection) were: 3 months, 90% (n=232), 6 months, 85% (n=218), 12 months, 85% (n=219). Rates of loss to follow-up were similar for each intervention arm (figure 1) and were not related to baseline participant characteristics (see online supplementary table S1). Recruitment flow diagram for the Smooth trial. Table 1 shows baseline characteristics of trial participants. The mean (SD) age of participants was 66 (9.1) years, 66% were female; the mean (SD) AUSCAN pain and function scores at trial entry were: pain 9.4 (3.6); function 14.8 (7.6). Overall, differences in participant characteristics across treatment arms at baseline were small, however, some between-group differences were observed for gender, marital status, social class, Body Mass Index and the presence of thumb OA. Interaction terms for the primary outcome (see online supplementary table S2) and all other outcomes were not statistically significant (p≥0.05), therefore, treatment effects were evaluated from the main effects model (ie, joint protection vs no joint protection; hand exercises vs no hand exercises) after adjustment for predefined potential confounders. Table 2 shows the number (%) of participants classified as ‘responders’ according to the OARSI criteria. At our primary end point (6 months), the proportion of people meeting the OARSI responder criteria was higher for joint protection (vs no joint protection) and hand exercises (vs no hand exercises). These differences reached statistical significance for the joint protection comparison. No statistically significant differences were observed at 3-month and 12-month follow-up for this measure. 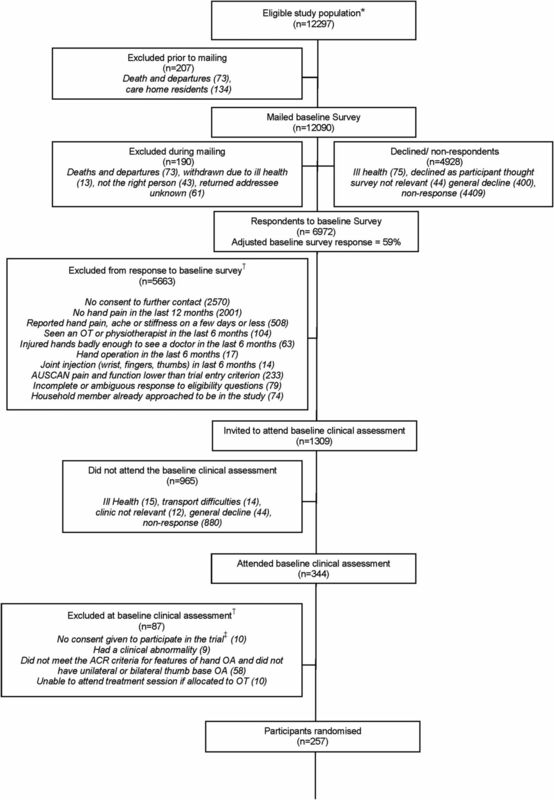 Evaluation of the components of the OARSI responder criteria found no significant differences in mean AUSCAN pain or function subscales for either treatment comparison or any follow-up time point (table 3). The percentage of participants reporting global improvement was significantly higher in the groups receiving joint protection compared with no joint protection, and hand exercises versus no hand exercises at 6 months, and also at 3 months and 12 months for the hand exercises comparison only (table 3 and see online supplementary table S3). From the remaining secondary outcomes (table 3), arthritis pain self-efficacy consistently showed statistically significant differences between those receiving, and those not receiving joint protection, at all time points, with participants receiving joint projection showing increased pain self-efficacy. Those allocated to hand exercises performed a structured exercise programme more often than those who were not (see online supplementary table S4). On average, participants allocated to joint protection used joint protection and energy conservation techniques more frequently than those who were not (see online supplementary table S4). Overall, these findings were largely replicated in a complete case analysis with no imputation of missing data (see online supplementary table S5). A per-protocol analysis of the OARSI responder criteria at 6-month follow-up replicated results from the ITT analysis, although statistical significance of the joint protection comparison was marginal (p=0.07) (see online supplementary table S6). No adverse events were reported as a result of the interventions. In this multicentre randomised controlled factorial trial, we evaluated whether joint protection education delivered by OTs was more effective in reducing hand pain and disability than no joint protection in community-dwelling older adults with hand OA. At 6 months, the primary end point, participants who received the joint protection intervention were statistically significantly more likely to be classified as responders to treatment than those not receiving joint protection (33% cf 21%). This was not maintained over 12 months. We also evaluated whether instruction in hand exercises was more effective in reducing hand pain and disability than no instruction in hand exercises, and found there was no statistically significant difference in the number of ‘responders’ between those receiving and not receiving hand exercises. Participants receiving joint protection education reported improved pain self-efficacy at 3- , 6- and 12-months. The research question arose from clinical practice and was shaped by OT and patient and public involvement.13 We followed the OMERACT-OARSI recommendations for design and conduct of clinical trials of OA.16 Our trial, therefore, had good internal validity with adequate sample size, high follow-up rates and strategies to minimise potential therapist effect. However, because we selected volunteers who indicated that they were able and willing to participate in an OT programme, the results may not be generalisable to all older adults with hand OA. All participants received the same advice and leaflet from the research nurse on entry into the trial prior to randomisation, and there were no differences between groups in the timing of this. Additional intervention was delivered using the same protocol for timing of treatment appointments for each arm (no additional treatment; joint protection; hand exercises; joint protection and hand exercises) and appointments for classes were monitored. Benefit of classes may have been diluted at 3 months as some participants failed to attend the first set of classes available so were still completing classes after the 3-month follow-up. Reviews of non-surgical treatments for hand OA31–33 and international guidelines7 ,8 have identified a gap in evidence for the effectiveness of non-pharmacological approaches in the management of hand OA in community-dwelling older adults. Guidelines acknowledge that the strength of the evidence underpinning recommendations for self-management is weak. They highlight one RCT12 comparing a joint protection programme plus home-based hand exercise (range of motion) versus information alone in 40 patients with hand OA. Stamm's study, while small, has been instrumental in informing clinical guidelines for hand OA.7 ,8 More recently, Stukstette et al11 investigated the effectiveness of an intensive group-based multidisciplinary treatment programme incorporating self-management, ergonomic principles and exercises. The findings of this study in participants recruited from rheumatology clinics suggest that such a programme is not effective in the short term. Our study has added to this evidence by investigating the independent effects of each intervention and demonstrating the effectiveness of joint protection in hand OA. All exercises were supervised in the classes by OTs experienced in treating hand OA, however, as we did not measure biomechanical outcome, we cannot determine whether our exercise programme had any effect (positive or negative) on joint deformities. Adherence to home exercises was good—those allocated to hand exercises performed a structured exercise programme more often than those who were not—but gains in grip strength and other performance measures were not shown to be statistically significant, contrary to findings of others.32 Adherence to joint protection approaches was also good, and it is possible that once joint protection principles are established, they may be easier to sustain in the shorter term, but the benefits tailor off in the longer term. Although the magnitude of benefit for joint protection was lower than our prespecified minimally clinically important difference, it still reached statistical significance due to the additional power available in our study from an overestimation of the percentage of participants meeting the OARSI responder criteria in the sample size calculation. Our study, therefore, adds to the evidence for expected differences between interventions and comparators for non-pharmacological studies in community-dwelling populations, 50 years and older, with hand OA. While hand OA is common, and has a significant impact and associated disability,34 consultations with a General Practitioner (GP) are low.6 People with hand problems consider the diagnosis of ‘hand OA’ to represent a serious condition, but they often perceive that nothing can be done.5 Our study population was recruited via the community using the ACR criteria for hand OA, hence, to have achieved any improvement in this group is important. Joint pain in older adults and OA are public health problems that challenge our healthcare professionals and healthcare delivery systems. We have produced clear evidence about the most clinically effective methods of delivering and supporting self-management at 6 months for older adults with hand OA to justify and inform guidelines and recommendations. We have shown that support for self-management, through a joint protection education programme delivered by OTs, provides an effective approach for community-dwelling older adults with hand OA. The authors would like to thank Rhian Hughes and the health informatics and administrative staff at Keele University's Arthritis Research UK Primary Care Centre, especially Jo Bailey, Tracy Whitehurst, Natalie Burgess, Tracy Reynolds and Claire Calverley, staff of the participating general practices in the Keele GP Research Partnership, Bucknall Hospital (pilot study), Haywood Hospital (training), Leighton Hospital and University Hospital of North Staffordshire (main study). The authors would also like to give special thanks to all the therapists and Therapy Managers, including: Nicky Walker, Lynette Bowler, Tracey Heath, Rebecca Wood, Debbie Ferneyhough, Carol Graham, Nickie Edwards, Heather Cowley, Helen Myers, Catherine Tyson, Helen Gibbs, Louisa Whitfield, Kath Griffiths, Noeleen Hellis, Helen Duffy, Hazel Mackey and Janice Lovatt; and Ricky Mullis and David Whitehurst for their valuable input into study design and development. The authors are grateful to the members of the Research Users Group (Teresa George, Vanda Hulse, Jo Bird, Dennis Grimsley) for their patient and public involvement. Thanks to Prof. Peter Croft and Prof. Danielle van der Windt for reviewing the manuscript prior to submission. We would like to thank our anonymous reviewers for their helpful comments and suggestions. Finally, the authors would like to thank Prof. N. Bellamy for permission to use the AUSCAN.
. The effect of osteoarthritis definition on prevalence and incidence estimates: a systematic review. Osteoarthritis Cartilage 2011;19:1270–85.
. Estimates of the prevalence of arthritis and other rheumatic conditions in the United States. Part II. Arthritis Rheum 2008;58:26–35.
. Symptomatic hand osteoarthritis in the United States: prevalence and functional impairment estimates from the third U.S. National Health and Nutrition Examination Survey, 1991–1994. Am J Phys Med Rehabil 2007;86:12–21. Centers for Disease Control and Prevention. Osteoarthritis. 2011. http://www.cdc.gov/arthritis/basics/osteoarthritis.htm (accessed 12 Dec 2012).
. The functional and psychological impact of hand osteoarthritis. Chronic Illn 2010;6:101–10.
. The impact of musculoskeletal hand problems in older adults: findings from the North Staffordshire Osteoarthritis Project (NorStOP). Rheumatology (Oxford) 2007;46:963–7.
. EULAR evidence based recommendations for the management of hand osteoarthritis: report of a Task Force of the EULAR Standing Committee for International Clinical Studies Including Therapeutics (ESCISIT). Ann Rheum Dis 2007;66:377–88.
. American College of Rheumatology 2012 recommendations for the use of nonpharmacologic and pharmacologic therapies in osteoarthritis of the hand, hip, and knee. Arthritis Care Res 2012;64:465–74. ; Guideline Development Group. Care and management of osteoarthritis in adults: summary of NICE guidance. BMJ 2008;336:502–3.
. Referral of people with osteoarthritis to self-management programmes: barriers and enablers identified by general practitioners. Disabil Rehabil 2008;30:1938.
. No evidence for the effectiveness of a multidisciplinary group based treatment program in patients with osteoarthritis of hands on the short term; results of a randomized controlled trial. Osteoarthritis Cartilage 2013;21:901–10.
. Joint protection and home hand exercises improve hand function in patients with hand osteoarthritis: a randomized controlled trial. Arthritis Rheum 2002;47:44–9.
. Self management, joint protection and exercises in hand osteoarthritis: a randomised controlled trial with cost effectiveness analyses. BMC Musculoskelet Disord 2011;12:156.
. Dimensionality and clinical importance of pain and disability in hand osteoarthritis: Development of the Australian/Canadian (AUSCAN) Osteoarthritis Hand Index. Osteoarthritis Cartilage 2002;10:855–62.
. The Australian/Canadian osteoarthritis hand index in a community-dwelling population of older adults: reliability and validity. Arthritis Rheum 2007;57:423–8.
. Design and conduct of clinical trials in patients with osteoarthritis of the hand: recommendations from a task force of the Osteoarthritis Research Society International. Osteoarthritis Cartilage 2006;14:303–22.
. The American College of Rheumatology criteria for the classification and reporting of osteoarthritis of the hand. Arthritis Rheum 1990;33:1601–10.
. Care and management of osteoarthritis in adults. BMJ 2008;336:502–3.
. One-year outcomes of a randomized controlled trial of an educational-behavioural joint protection programme for people with rheumatoid arthritis. Rheumatology (Oxford) 2001;40:1044–51.
. Clinical Applicability of an Educational-Behavioural Joint Protection Programme for People with Rheumatoid Arthritis. BJOT 2002;65:405–12.
. The long-term outcomes from a randomized controlled trial of an educational-behavioural joint protection programme for people with rheumatoid arthritis. Clin Rehabil 2004;18:520–8.
. Effects of a modular behavioural arthritis education programme: a pragmatic parallel-group randomized controlled trial. Rheumatolgy (Oxford) 2008;47:1712–18.
. Effectiveness of corticosteroid injections versus physiotherapy for treatment of painful stiff shoulder in primary care: randomised trial. BMJ 1998;317:1292–6.
. OMERACT-OARSI initiative: Osteoarthritis Research Society International set of responder criteria for osteoarthritis clinical trials revisited. Osteoarthritis Cartilage 2004;12:389–99.
. Development and evaluation of a scale to measure perceived self-efficacy in people with arthritis. Arthritis Rheum 1989;32:37–44.
. A Grip Ability Test for use in rheumatology practice. J Rheumatol 1995;22:1559–65.
. Design, analysis and presentation of factorial randomised controlled trials. BMC Med Res Methodol 2003;3:26.
. Effectiveness of community physiotherapy and enhanced pharmacy review for knee pain in people aged over 55 presenting to primary care: pragmatic randomised trial. BMJ 2006;333:995. StataCorp. LP. Stata/IC 12.1 for Windows. 2012.
. There is inadequate evidence to determine the effectiveness of non-pharmacological and non-surgical interventions for hand osteoarthritis: an overview of high-quality systematic reviews. Phys Ther 2009;89:1363–70.
. A systematic review of conservative interventions for osteoarthritis of the hand. J Hand Ther 2010;23:334–50; quiz 351.
. Systematic review of design and effects of splints and exercise programs in hand osteoarthritis. Arthritis Care Res 2011;63:834–48.
. Prevalence of symptomatic hand osteoarthritis and its impact on functional status among the elderly: the Framingham Study. Am J Epidemiol 2002;156:1021–7.
. Self-efficacy: toward a unifying theory of behavioral change. Psychol Rev 1977;84:191–215.
. The health belief model: origins and correlates. Health Educ Monogr 1974;2:336.
. Chapter 3: the health belief model. In: Glanz K, Rimer BK, Viswanath K. eds. Health behaviour & health education: theory, research & practice. 4th edn. Jossey-Bass: San Francisco, 2008.
. Self-management methods. In: Kanfer FH, Goldstein AP. eds. Helping people change: a textbook of methods. 4th edn. Pearson, 1992.
. Skills for communicating with patients. 2nd edn. Oxford: Radcliffe Publishing, 2004.
. Pocket guide to teaching for medical instructors. London: BMJ Books, 1999.
. Motor control and learning: a behavioural emphasis. 5th edn. Champaign, IL: Human Kinetics Ltd, 2011. Office for National Statistics. Standard Occupational Classification. 2000. http://www.ons.gov.uk/about-statistics/classifications/archived/SOC2000/index.html (accessed 14 Mar 2011).
. 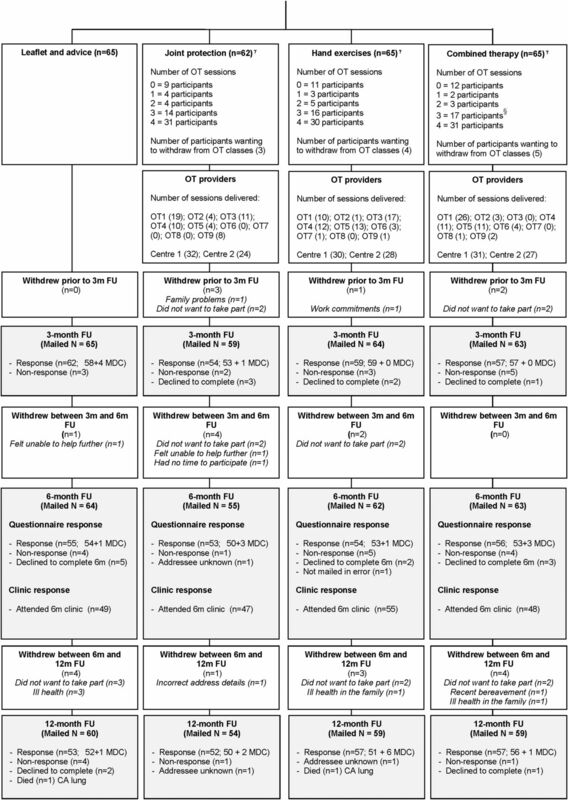 Multiple imputation using chained equations: issues and guidance for practice. Stat Med 2011;30:377–99. StataCorp. STATA multiple imputation reference manual. Release 12.0. 2011. Contributors All the authors vouch for the data and analyses as well as the fidelity of the study to the protocol. The first and second authors wrote the first draft of the manuscript; all the authors participated in writing subsequent drafts and made the decision to submit the manuscript for publication. Funding This study was supported financially by a Project Grant awarded by Arthritis Research UK, Grant Code: 17958 and by Support for Science Funding secured by North Staffordshire Primary Care Research Consortium for NHS service support costs. The Data Monitoring Committee was conducted by Chris Roberts (Chair), Christina Jerosch Herold, and Richard McManus. Competing interests KD was a member of the NICE OA Guideline Development Group and is a current NICE Fellow. No other potential conflict of interest relevant to this article was reported. Disclosure forms provided by the authors are available with the full text of this article at http://ard.bmj.com. Ethics approval North West 7 Research Ethics Committee UK (rec reference: 07/H1008/235). Data sharing statement Our Centre has established data sharing arrangements to support joint publications and other research collaborations. Applications for access to anonymised data from our research databases are reviewed by the Centre's Data Custodian and Academic Proposal (DCAP) Committee and a decision regarding access to the data is made subject to the NRES ethical approval first provided for the study and to new analysis being proposed. Further information on our data sharing procedures can be found on the Centre's website (http://www.keele.ac.uk/pchs/publications/datasharingresources/) or by emailing the Centre's data manager (data-sharing-pcs@cphc.keele.ac.uk).